Angelus: Three loci of wonder in our lives: the other; history; and the Church. 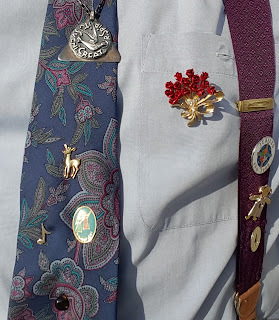 The other: Since Jesus was born, everyone carries the features of the Son of God, especially the poor, since God entered the world as a poor person and allowed himself to be approached first by the poor. History: Often we think we see it right but risk reading it backwards, such as when we think the market, finance, business, and powers-that-be determine it. But God shuffles the deck! As Mary sings, the Lord casts down the mighty and lifts up the lowly, fills the hungry and sends the rich away empty. The Church: To look on her with the wonder of faith means feeling her as a mother who, despite her warts and wrinkles, lets the bride's contours shine through. God gives us himself by giving his Son, his joy; only with Mary's heart can we be glad for his gift and surprise: may she help us to perceive these wonders: the other, history, and the Church. May we feel the wonder in meeting Jesus, but we can't meet him if we don't meet him in the other, in history, and in the Church. To Roman Curia: When we met in 2013, I stressed professionalism and service and offered Joseph as a model. Last year we spoke of temptations or "maladies" that could affect any Christian, curia, community, congregation, parish, or movement, calling for prevention, vigilance, care, and sometimes painful interventions. Some became evident this year, causing everyone pain and harming many. The reform will move forward with determination, clarity, and resolve. Diseases and scandals don't obscure the services you render me and the Church with such effort, responsibility, and commitment. Cases of resistance, difficulty, and failure are lessons and opportunities for growth, not discouragement; they're opportunities for returning to essentials, being more conscious of ourselves, God, and neighbor, sensus Ecclesiae, and sensus fidei. The Holy Year of Mercy is a summons to gratitude, conversion, renewal, penance, and reconciliation. Christmas is the feast of God’s mercy: "Could greater mercy have been shown to us than what led the Creator to come down among us and take on our mortal body? That same mercy led the Lord to assume the nature of a servant, so that, being bread, he'd suffer hunger; being satiety, he'd thirst; being power, he'd know weakness; being salvation, he'd experience our woundedness, and being life, he'd die. He did this to assuage our hunger, alleviate our longing, strengthen our weakness, wipe out our sins, and enkindle our charity" (Augustine). Missionary and pastoral spirit: missionary spirit makes the Curia fruitful and proves our effectiveness. Faith is a gift, yet its measure is seen by how we communicate it. All the baptized are missionaries, by their lives, work, and witness. Pastoral spirit is indispensable: daily following the Good Shepherd who gives his life to save others. Without these two wings we could never take flight or enjoy the happiness of the faithful servant. Spirituality and humanity: spirituality is the backbone of all service in the Church and Christian life; it nourishes our activity and protects it from human frailty and temptation. Humanity embodies our faith; those who renounce their humanity renounce everything. It distinguishes us from machines that feel nothing. Once we find it hard to weep or laugh, we've begun our decline. Humanity is knowing how to show tenderness, fidelity, and courtesy. While innate, they need to be activated, attained, and demonstrated. Rationality and gentleness: rationality helps avoid emotional excesses, while gentleness helps avoid excess bureaucracy; both are necessary for balance: “The enemy pays careful heed to whether a soul is coarse or delicate; if delicate, he finds a way to make it overly so, to cause it greater distress and confusion.” Every excess is a symptom of imbalance. Innocuousness and determination: innocuousness makes us cautious, careful, attentive, and capable of refraining from hasty actions; it brings out the best in ourselves and others. It consists of doing unto others what we'd have them do to us. Determination is acting with resolute will, clear vision, obedience to God, and for salus animarum (Code of Canon Law 1752). Charity and truth: two inseparable virtues, “speaking the truth in charity and practising charity in truth.” Charity without truth becomes complaisance; truth without charity, legalism. honesty (Onestà) and maturity: honesty is rectitude, consistency, and sincerity regarding ourselves and to God. Honest persons never betray others' trust, are never domineering regarding the persons or matters entrusted to them. Honesty is the foundation of all other qualities. Maturity, the quest for balance and harmony in our gifts, is the goal and outcome of an ongoing process of development that has nothing to do with age. Respectfulness and humility: respectfulness is an endowment of those who always try to respect for others, for their work, for confidentiality, who can listen carefully and speak politely. Humility is the virtue of those who become more important as they come to realize they're nothing, and can do nothing, apart from God’s grace. Diligence and attentiveness: the more we trust God, the more we grow in diligence and readiness to give of ourselves. What good would it do to open all the Holy Doors if the doors of our heart are closed to love, if our hands closed to giving, if our homes to hospitality, and our churches to acceptance? Attentiveness is concern for little things, for doing our best and never yielding to our vices. “Lord, help me to be always aware of those around me, those who are worried or dismayed, those suffering in silence, and those who feel alone and abandoned” (Vincent de Paul). Intrepidness and alertness: intrepidness is fearlessness, acting with boldness and determination “as a good soldier,” ready to take the first step, like Abraham or Mary. Alertness is the ability to act freely and easily, without being attached to material things. “If riches increase, don't set your heart on them.” To be alert means to be on the go, never burdened by accumulation of needless things, caught up in our concerns, or driven by ambition. trustworthiness (Affidabilità) and sobriety: trustworthy persons honor their commitments whether observed or alone; they radiate tranquility because they never betray trust. Sobriety is the ability to renounce the superfluous and resist consumerism; it's prudence, simplicity, straightforwardness, balance, and temperance, seeing the world through God’s eyes and from the side of the poor. Sobriety is a style of life that points to the primacy of others and is shown in a life of concern and service. Sober people are consistent and straightforward, because they can reduce, recover, recycle, repair, and live moderation. Looking for the next installment of Fr. Cantalamessa's 3rd Advent sermon? Come back tomorrow! Zep 3:14-18a Shout for joy! God has removed the judgment against you and turned your enemies away. Fear not; the Lord is in your midst, a mighty savior; he'll rejoice over you and renew you in his love. Ps 33:2-3, 11-12, 20-21 "Exult, you just, in the Lord! Sing to him a new song." Give thanks on the harp and lyre. Blessed those he chose for his inheritance. We await and trust the Lord, our help. 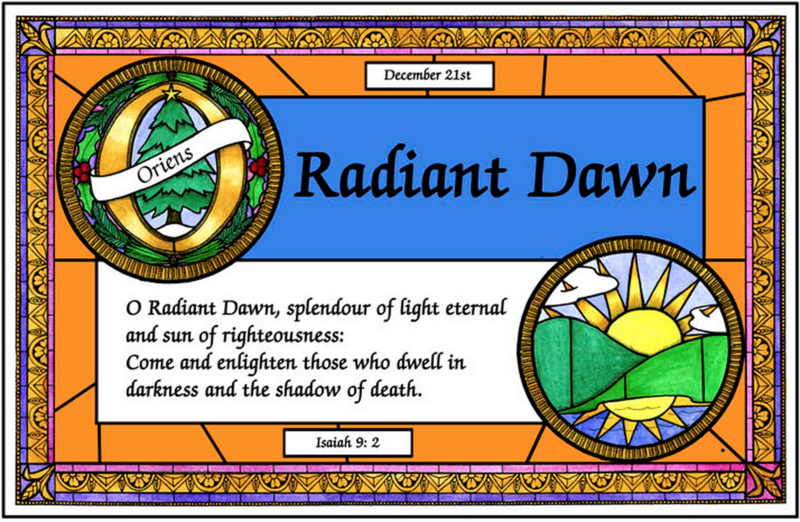 Today's O Antiphon: O Oriens, O Radiant Dawn (Morning Star, Rising Sun), splendor of eternal light, sun of justice: come and shine on those who dwell in darkness and in the shadow of death. One Bread, One Body: "How to get God to sing": Christmas is Jesus' birthday; let's give him presents that will get him to sing joyfully: our repentance and conversion, and leading others to him. Passionist: As we near a friend's birthday, there's a festive mood. 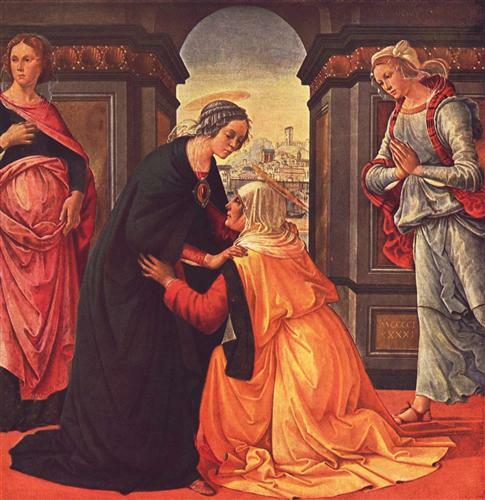 Today's gospel is devoted to Elizabeth's joy at Mary's visit. Elizabeth is thrilled at Mary's effort to be near. Both were experiencing their childbirth event in remarkable ways. Today’s gospel is devoted to Elizabeth’s joy, based on her experience of becoming pregnant late and on what her now mute husband conveyed, doubtless enhanced by contrast with the sorrow of not having been able to conceive earlier. The Zephaniah reading is also joyful, following a painful ordeal. Though its circumstances and joy differ. it also occurs after a drought of good news. As Elizabeth and Zechariah went through sad times, so too Jerusalem experienced sorrow over the calamities inflicted on it by its enemies, permitted by the Lord as a result of their sin. But Zephaniah indicates Jerusalem is to enjoy peace and prosperity. So in both readings is sorrow, then joy. Isn't it often like that for us? Mary and Elizabeth were coming off stressful moments, making their joy when Mary visited understandable, as was Zephaniah’s at Jerusalem's upcoming relief. Universalis: St. Peter Canisius, Jesuit priest, doctor; see Catholic Encyclopedia (written pre-canonization), Wikipedia.